A few years ago I was regularly attending a sewing club. Occasionally, the project demonstrator would say something like, “…and you’ll want to use a 40 weight thread when you blah, blah, blah.” And, they lost me right then and there because I didn’t really understand thread weight and what it meant. Generally speaking, when I have a project that needs sewing I will pick up a matching spool of Gutermann thread at Joann’s and happily sew my project. When I purchased a sewing machine that embroidered, things got a little complicated. All of the sudden thread weight was a pertinent topic that needed understanding. The second thing you need to know is the thread weight numbers aren’t always clearly stated. Occasionally you will see thread weight that looks like a fraction and is labeled 50/2 or 40/3. The second number indicates thread ply. So, a 50/2 cotton thread would be 50-weight 2-ply thread that is thin and strong. The key point to remember is having two or more plies of thread equals stronger thread. Understanding thread weight becomes confusing because there really is no universal standard of thread measurement. Only the people on the thread manufacturing side really understand terms like Cotton Count, Denier, and Tex. Occasionally, these terms are slipped into the information on the end of a spool and confuse us further. Which thread should I purchase for my project? The most common fabric store threads would be considered an all-purpose 50 wt. thread. These threads are polyester or a poly/cotton blend. For instance, Gutermann and Mettler all-purpose threads are a Polyester 50/3 thread. This is suitable for most sewing projects and will hold your project together quite well. Keep in mind that a 50 wt. all-purpose thread is significantly different from a high quality 50 wt. cotton quilting thread. Both threads will sew well into garments or quilts. However, it is recommended that you choose a higher quality 50 wt. cotton thread for quilting projects. Higher quality 50 wt. threads offer a nice thin thread that won’t add a lot of bulk to seams when piecing a quilt. They are also ideal for machine quilting, appliqué, hand piecing, and hand appliqué. Over the last year, I have been slowly switching to high quality 50 wt. thread for most of my sewing projects. Below are two popular brands of high quality 50 wt. threads that will go the distance. When I think of 40 wt. thread, I think of shiny embroidery thread. And, for the most part, that’s what you would want for most machine embroidery projects. Occasionally, you may run into a 30 wt. embroidery thread that is a bit heavier than a 40 wt., but it isn’t as common. Most 40 wt. threads are made from either rayon or polyester. It used to be that rayon was considered the better of the two because of its sheen and color choices. However, rayon has its drawbacks. It tends to easily break when sewing and doesn’t hold up well to everyday laundering conditions. Recently, great strides have been made with 40 wt. 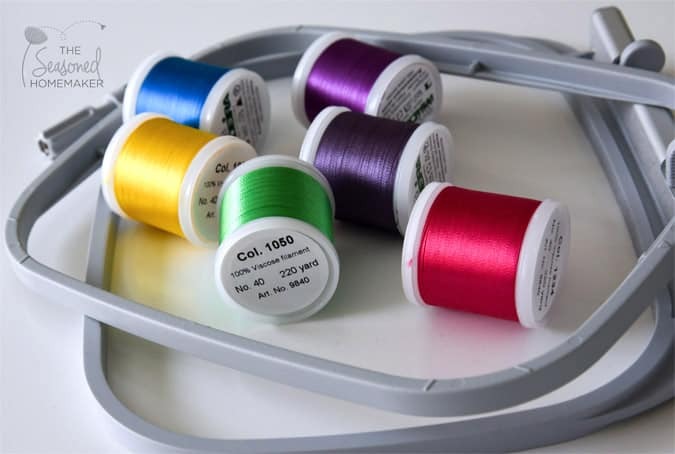 polyester thread for machine embroidery. Polyester threads can now match rayon threads for both sheen and color choice. It is now my thread of choice for machine embroidery. 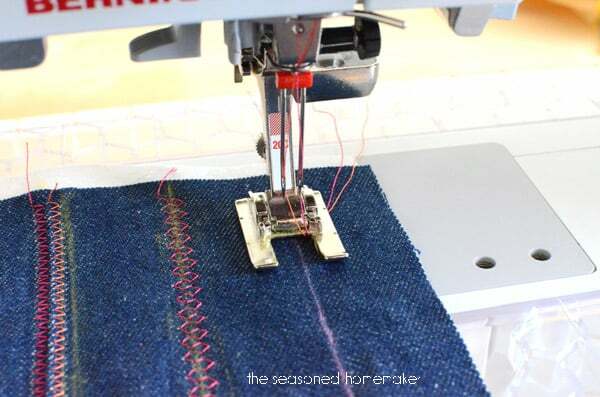 Don’t dismiss this thread if you don’t own a machine that includes an embroidery feature. I use 40 wt. 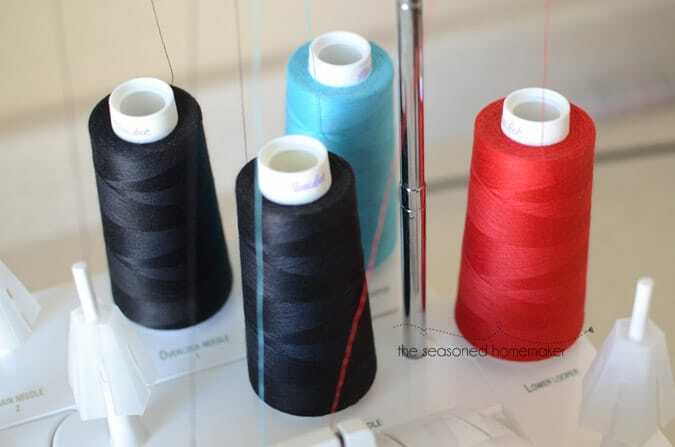 polyester thread for sewing decorative stitches and appliqué. It adds a little shine and a lot of color. The key to successful sewing with 40 wt. thread is in using the right needle. I recommend using an Embroidery needle because it has a large eye and a special scarf that will protect delicate threads. The combination of these two things will prevent thread breaks when sewing. High-quality serger thread is also a 40 wt. polyester thread. The difference is serger thread has a special coating that allows it to withstand the high speed and tension demands of serging. 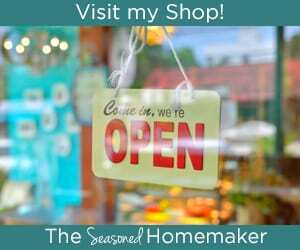 I have been known to use my serger thread for all-purpose sewing. It generally performs quite nicely. It is a bit heavier than a 50 wt., but this wouldn’t make a difference if you were sewing something like a pillow or bag. If you want to do some hand stitching or heavy topstitching then a 12 wt. – 18 wt. thread will be your best choice. The 12 wt. Aurifil thread in the above photo (affiliate) is ideal for hand quilting or even hand embroidery. It would work equally as well for topstitching denim. Most of the heavy duty topstitching thread you see at sewing stores will likely be 18 wt. which would work, too. However, it’s important to look at thread quality. Using an inferior quality heavyweight thread for hand stitching or careful top stitching may cause a lot of thread breaks or fray on garments. I like to use these heavier threads for straight stitch appliqué. It defines the stitching and adds another layer of texture to a project. Occasionally, you will see a 12-18 wt. variegated thread that is suitable for hand quilting or defined machine quilting. (affiliate) I don’t own very many of these threads, but they definitely can add drama to all types of projects. Note: When using heavier threads like these you will likely have to adjust your tension a bit. Another option for hand quilting or hand stitching is a 28 wt. thread. Like the number indicates, it sits somewhere between a heavier 12 wt. and a super fine 50 wt. I’ve never used this thread, but have seen it on a small hand-quilted project. I thought that it was ideal for hand quilting because it defines the quilting without being overly heavy. 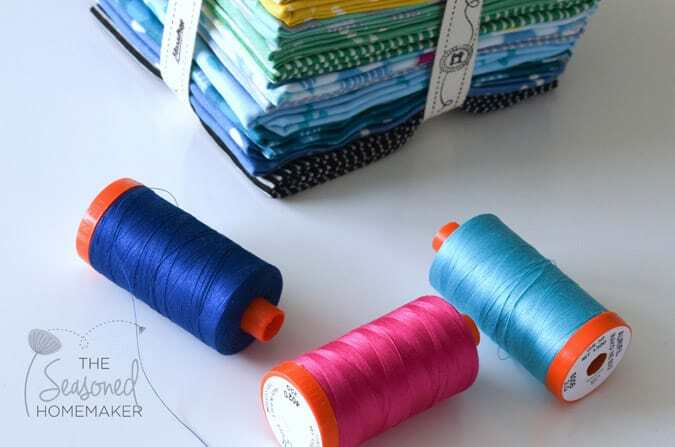 This thread is harder to find and you are more likely to see it in a set such as this one: Aurifil Thread Set (affiliate) Whenever I see 28 wt. threads in stores or at quilt shows, I like to pick up one or two in neutral colors since I wouldn’t use it that often. If you machine embroiders then you’ve probably used a 60 wt. bobbin thread. This super thin polyester thread is ideal in the bobbin when the back of your project will never show. Like I said earlier, the only thing you really need to know is this: The higher the thread weight number, the thinner the thread. Knowing a little more about different thread weights opens up all sorts of options for future projects. I encourage you to step out a bit and try some different weight threads in future projects. Top stitch a bag handle with a 12 wt. thread. Add a decorative stitch to the hem of a garment using a 40 wt. polyester thread. 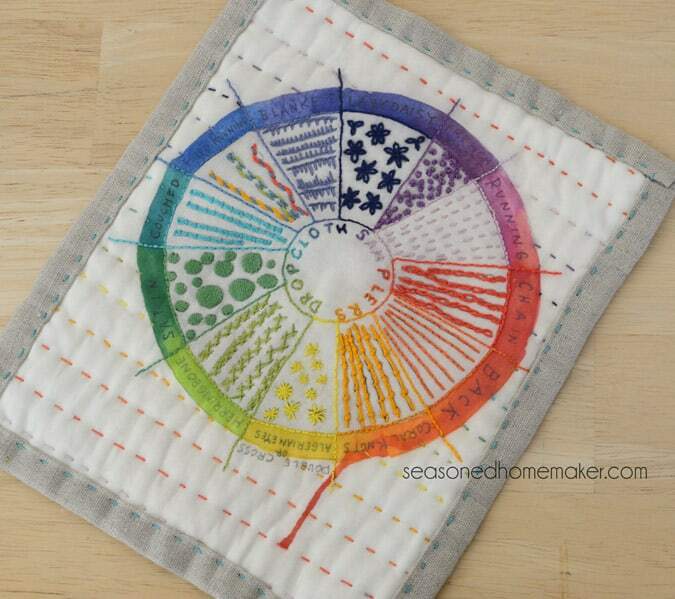 Experiment with variegated threads on your next quilt project. Most importantly, imagine the possibilities. So much terrific information on thread and thread weights and what they are used for, I always grab a spool of Gutermann and consider it done, now I’ll check out some of the other threads, Thank you!!! The key thing that I’ve learnt is about the plys of threads. A 40wt 3 ply thread is thicker than a 40wt 2 ply thread. The weight number refers to the the weight of 1 ply – so in a 40wt 3 ply thread you have 3 lots of 40 ply and in a 40wt 2 ply thread you have 2 lots of 40 ply. One other important thing I’ve learnt over the years is that industrial thread such as you might use for sewing canvas or deck chair fabric or even bags etc as it is UV stable (I occasionally sew sail canvas) is thinner the lower the number quoted. On a domestic machine V69 thread is usually used, though some may be able to sew with V92 which is thicker. Excellent. Thank you adding such valuable content to this discussion. Thank you for sharing this link to a greatly informative article. This is a very helpful post. I imagine there are more than a few novice sewers who are wondering why thread breaks or doesn’t work for their project. I only know because my mom sewed a lot. Have a good day! What an informative article! I learned so much from reading this. Thanks for taking the time to share. I’m a relatively new sewer/quilter, and I am learning so much! Thank you for that explanation. I always thought that embroidery and serger thread was thinner than regular sewing thread. Since I work in a fabric store, I can use this information to better serve my customers. Thank you for the informative post. I work in a fabric store, and this information will help me to better serve my customers. I had always thought that embroidery and serger threads were thinner than regular, everyday thread. I had noticed differences in threads, but didn’t know the reasons. Good to know. Thank you so much for the information, Leslie!!! Great info Leslie!! You always provide such clear concise info thats easy to understand and put into practice! Gutermann is my go to! Thank you for this information about thread weight. I am sewing more and more and I really needed this. I really enjoy your pointers. They have helped me so much. A Jo Anns fabric store just opened in our town. I will be checking it out as soon as possible. Thank you again for the great information you provide. Excellent article on thread weight. Thanks for sharing. I have Mettler 60 wt in beautiful colours which is perfect for hand apliqué. Great article! I recently had my Pfaff embroidery machine serviced. The built in “snips” blade had broken. I was told the 100% polyester thread may be too strong to use in the bobbin of these machines. I wondered if anyone else has found this to be a problem. Hi, Leslie! Fabulous content in this post! Wow! I’m going to have reread it numerous times just to keep it straight in my brain. A month ago I became THE proudest owner of a pre-owned Babylock Ellisimo; I’d swear the lady who cared for it before me took better of it than she did her children!! When I purchased it from the store, one of the owners said, “never use cheap thread in this machine.” I find Mettler and Gutermann to work the best by far. Sulky, in any form–breaks, which is a darn shame because they beautiful two-toned shiny threads. I’ve noticed Jo-Ann’s sometimes has “recyled” Gutermann thread. WHAT IS that? I’ve shyed away from the all cotton thread and stayed with polys, because as a new sewer, I’m learning to sew straight lines, navigate turns, etc., and am doing so by making baby burp cloths and blankets until they’re coming out my ears! Gutermann and Metler both seem to work fine for machine embroidery at 40 wt. for me and I’m having a gay old time! The store owner is absolutely right! Use high quality thread. Give me a bouquet of beautiful thread any day of the week! I have always wondered what would be the best thread for monogramming? I prefer Floriani polyester thread for all of my embroidery. I use Floriani as well and it works great on my brother embroidery machine. I also buy the packs of brother bobbin thread from Amazon. They go a long way and you can fill them again if your supply is short. I donate empties to the sewing machine shop who has classes. Thank you for helpjng me understand all thise thread numbers! I am new to machine embroidering. I am using a 40 weight thread at the top. Which weight should I use in my bobbin? My bobbin has been showing at the top of my design. I would try using a 60 wt. in the bobbin. What weight thread is best for free motion quilting? I prefer 50 wt., but 40 wt. can add a nice dimension. I recently made a weighted blanket for my husband and have no idea what weight/ply I used. I sewed the rows and columns twice, to make it stronger, but I’ve noticed the threads are breaking and the pellets, that give it the weight, are coming out of the blanket. I didn’t use strong enough thread. What type material (cotton, polyester, poly-cotton, etc), weight and ply should I use for weighted blankets so I don’t run into this problem in the future? I pulled out a few spools of thread to see if I can determine the weight/ply and I’ve seen some that say size 50. Is size 50 the same as 50 weight? Also, I’ve seen some that use m after a number, like 228m or 183m, is that a size? You mention a 50 wt all-purpose thread is significantly different than a 50 wt cotton quilting thread. If not stated on the spool, how does one differentiate between high quality and an all purpose thread? Not all thread is the same. For this type of project I’m really not sure what to recommend. I would check with a local sewing store and show them your project. Be sure to bring your threads. They should be able to recommend a better option.